I found some lovely insect flashcards from the early 60s in a thrift store. They have nice, detailed drawings and for my first clay interpretation, I chose the silverfish. Not as intrusive as a cockroach, but you're never alone when there's a silverfish afoot. I've been calling these vaguely ghost-shaped objects Metachamsas since they're made from the outline of the fingers of a chamsa. The shape appeals to me but I'm not sure why. Also, my shelf is now almost full again so I need to switch to smaller objects until these larger ones are dry enough to move to the kiln room. I visited the Bay Area this past week and set free this large clay eye at San Gregorio Beach south of Half Moon Bay. The Meercat sculpture is now placed on top of the pot. I resisted the urge to make hair texture on the sculpture and pot. 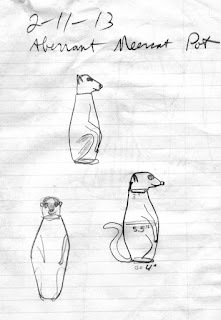 I decided that I wanted the meercat sculpture to end up on top of a pot instead of as a stand-alone sculpture. I made a new coil/slab pot for it tonight. A few nights ago I made a coil/slab pot that was intended to be part of a vessel with a sculpture of a meercat's head on top. I managed to sculpt a meercat that I'm happy with, but the pot started to collapse when I put the sculpture on top. It may need to dry more or it may be the wrong shape. I tried to give it some contour by having it grow narrower from the base and then wider again, but this may cause the pot to be too structurally weak to hold the weight of a sculpted meercat. I attempted to remedy the problem by adding another strip of clay to the weak, concave part near the base, but I'm not sure if it's going to work. I may need to forget the pot and just make a bust of meercat. These are scraps left over from various projects. Spare baby heads (I hate to waste a perfectly good baby head). Spare warthog eyes left over from the Aberrant Warthog Pot. An extra skull from Horned Devotion Cup 1. I haven't found a use for the clay hands yet. 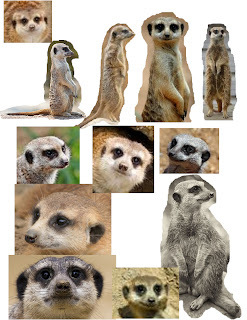 Someone on Facebook responded to the Aberrant Warthog Pot with "Hakuna Matata" and the appropriate response seemed to be to pledge my next piece to be an Aberrant Meercat Pot, keeping with The Lion King theme. Tonight I made a slab pot in the planned shape, although mine didn't come out as symmetrical as the one in the illustration. Tonight I added the tentacle-like texture between and around the eyes on this pot. Here's another WIP: another Cthulhu Idol. 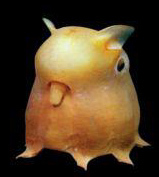 There really is an organism called the Dumbo octopus. Octopuses of the genus Grimpoteuthis are some of the rarest and deepest dwelling of their kind. The protruding fins must have reminded someone of the mutant baby elephant in the well-known Disney film. This Cthulhu Idol broke in several places in the kiln. It could have been tiny air pockets in the extremities or some other unforeseeable kiln accident, but I suspect someone dropped it. It's not one of my better Cthulhuines, so it's not a great loss. I glued the pieces back together and painted it with acrylics. Yesterday I learned that my Eleven-Eyed Pot had finally sold at Tucson Clay Co-op's gallery. I'm happy to make a sale, but it leaves me curious about what happens to the piece after it leaves the gallery. I think I would be happier to stay in communication with the buyer and get yearly update pictures of its condition and location. I started a new eye pot, this one with thirteen eyes. These are a third set of metachamsas, clay objects formed from the outline of a chamsa. I was originally calling them "black ghosts" and it has been pointed out to me that they don't look like "real ghosts." Also, not all of them are black. 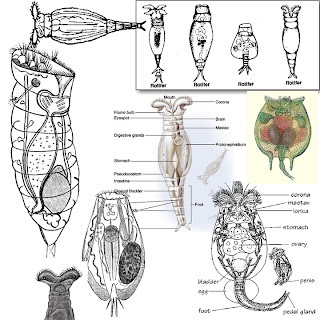 Rotifers are tiny animal lifeforms which are distantly related to arthropods. They're transparent, cup-shaped creatures which can be viewed under a microscope. 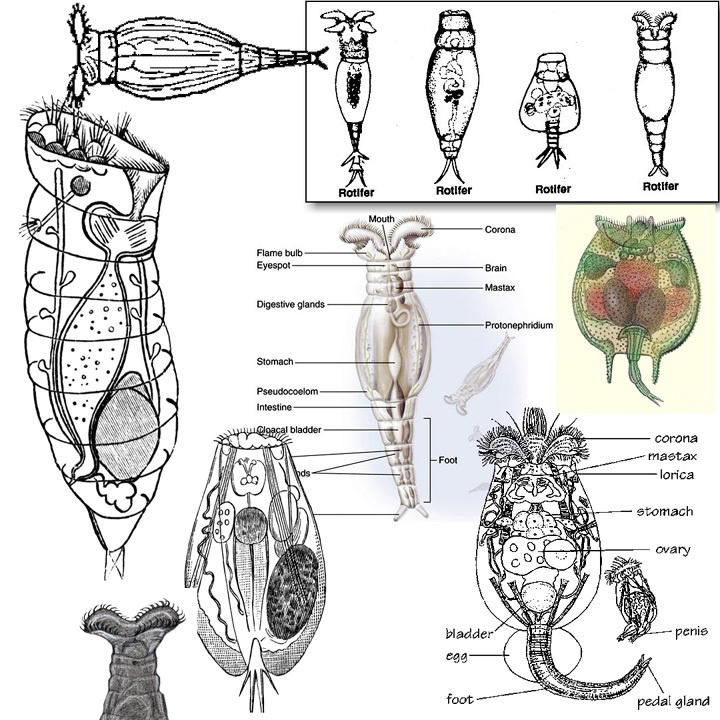 Most of the images I found showed and labeled the rotifer's internal structures and I attempted to recreate this in clay. Clay is not transparent of course, so it came out looking like the end results of a rotifer dissection. Some of the structures match what I saw in images and others are added just to make it look like there's a lot going on in there. The pot is actually more aberrant than the warthog. Maybe it should have been "Warthog Aberrant Pot." I had been intending on making another Warthog Column, but it came out as a pot in five pieces. I like how the warthog came out. The pots look very primitive.